We all seem to be in a festive mood as we approach the New Year. With December coming to an end, what is it that you are planning to indulge in? If you are unsure, then let me suggest that you indulge in watching some plays. Watching a play is a unique experience. It is a live performance and they have something magical about it. When you are watching a film, you are reliving the performance of the actors on the screen. In a play, you get to see the artists creating art right in front of you. No two performances of even the same play are ever the same. There are highs and lows and the energy of the actors touch on your psyche. You are moved by a live performance in a way that recorded performance will never be able to replicate. Do not take my word for it, visit these places and be witness to a play in Bangalore yourself. This is a Bengali comedy of two hours length. It is a story about a blind girl called Tamasa (joke in Bengali) who all of a sudden regains her vision after eight long years. Upon removing her blindfold, she discovers that she is unable to see the human face of anybody. Rather she sees faces of various animals on everybody. Be it her apparently loving husband, the nurse that used to attend to her, her father-in-all, all of their faces are replaced by the face of an animal. This situation gives rise to a lot of humorous situations on the stage. The play is directed by Sayandeb Bhattacharya along with acting in it. The other artists are Dipankar Banerjee and Priyanka Bhattacharya. The Hindu in its review has called it a depiction of a universal truth. Place: RangaShankara, JP Nagar, Bangalore; Date: Dec. 30; Price: Rs 100. This is a Kannada drama of one and a half hour in length. This is a Kannada adaptation of a German Play by LutsHubner by S. Surendranath about a road trip by four young people from different socio-economic backgrounds. The road trip brings out the worst in each of them and brings out issues regarding stereo typing, issue of the migrants, gender-politics and monetary power. The play brings out the respect that each character has for the others regarding the position they are coming from. 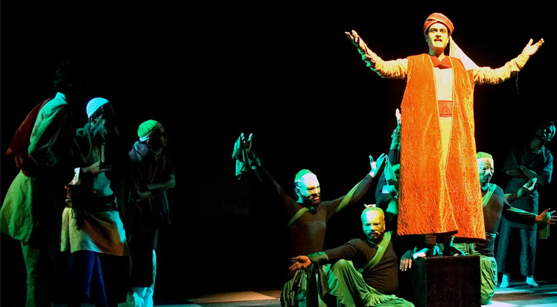 The play is directed by S. Surendranath and has a cast comprising of Shrunga B.V., Sandip Jain, Ujvala Rao, VarshaHegde. Place: RangaShankara; JP Nagar, Bangalore; Date: Jan. 02 & 03; Price: Rs 100. This is a Kannada comedy of one hour and fifteen minutes in length. This is a Kannada adaptation of the Italian one act play by Dario Fo called The Virtuous Burglala or Nor Tutti I LardiVengono Per Nuocere. It has been translated by K. V. Akshara and it deals about misunderstanding which leads to comical fun. It is directed by Sanchari Vijay and has a cast comprising of Prasanna Shetty, Nisha Gowda and Girish Bhat. Place: RangaShankara. JP Nagar, Bangalore; Date: Jan 04; Price Rs 100. Watch any of these plays and take home an experience that will last for a long time. Author’s Bio: The author is a theatre enthusiast and watches plays and writes about them for a living. He also contributes his articles to eventshigh.